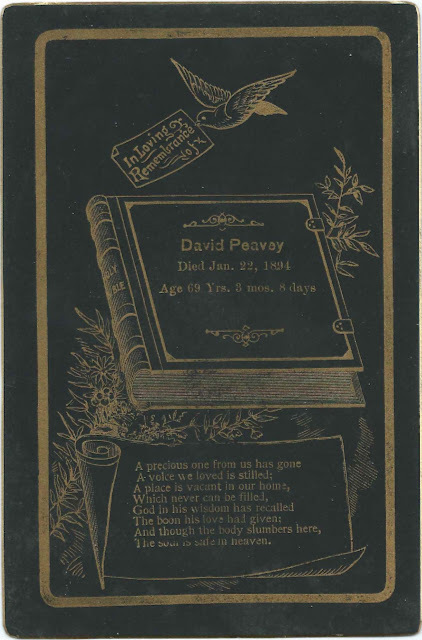 Memorial card for David Peavey, who died January 22, 1894 at the age of 69 years, 3 months and 8 days. The card was found with a collection of photographs from Maine, Michigan, New Brunswick and Rhode Island, one of which is the photograph of Helen Eola Mayo, daughter of Benjamin W. Mayo and Ida A. (Peavey) Mayo. Ida was the daughter of David H. Peavey and Betsey (Wentworth) Peavey. Because of the inclusion of the photograph of Helen Eola Mayo in the collection, I believe that the David Peavey memorialized was her grandfather father David H. Peavey. 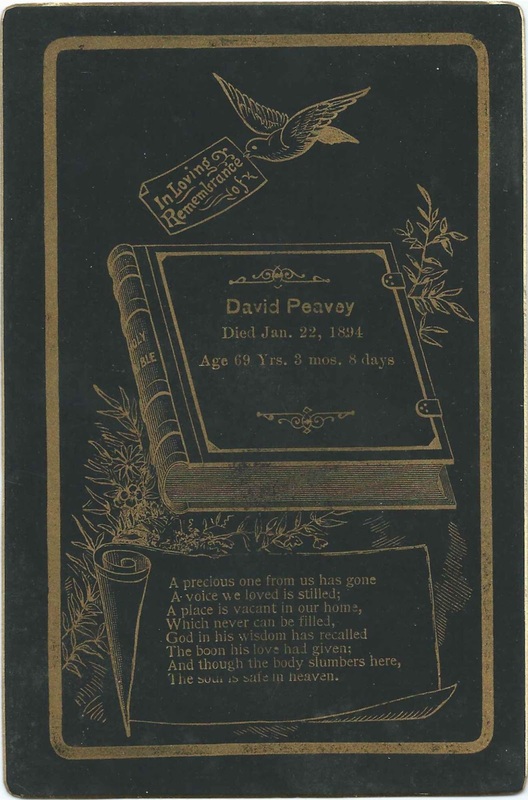 According to a record in Maine Deaths and Burials, 1841-1910, David H. Peavey was born about 1825 and died on January 23, 1894, a day off from that noted on the card. This David, born possibly at Tuftonborough, New Hampshire, was the son of John S. Peavey and Salley (York) Peavey, who had moved their family to Maine by the time of the birth of their daughter Sarah, born about 1836 at Exeter, Maine. The 1850 Census of Corinna, Maine, lists a widowed Sally with David and other siblings. Not long after, on October 31, 1851, at Exeter, Maine, David married Betsey Wentworth, daughter of Thomas Wentworth and Hannah (Mann) Wentworth of Exeter. David and Betsey had at least four children and lived in several Maine towns, all close or not far: Exeter; Charleston; Orneville [designated on the map below as Southeast Piscataquis]; and Garland. They're buried in the Evergreen Cemetery at Garland, Maine. If you have corrections and/or additions to the information above, or if you believe that the memorial card is that of another David Peavey, please leave a comment or contact me directly.